This report reveals that Australia is in the top five in the world’s first international assessment of young people’s financial literacy. 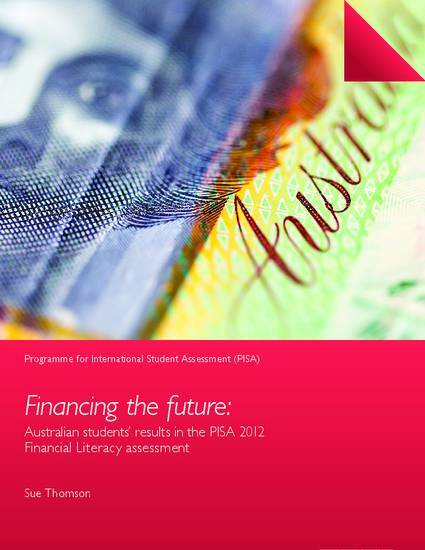 Conducted in 2012 as part of the Programme for International Student Assessment (PISA) of the OECD with support from the Australian Securities and Investments Commission as the Australian Government agency responsible for financial literacy, the supplementary PISA financial literacy assessment measured 15-year-olds’ knowledge of personal finances and ability to apply it to financial problems. A total of 29 000 students from 18 countries and economies participated in the assessment, including approximately 3300 Australian students from 768 schools. According to the ACER report, Australian students achieved an average score of 526 points, significantly above the OECD average of 500 points.